I rarely cook a protein, starch, veg meal anymore. And I rarely eat fish either. Our oceans are just so endangered, that it’s a once-in-awhile treat these days. And it’s gotta be on Seafood Watch’s green list, or I’m not even eating it as a treat. If you’ve never cooked sablefish, you’ll find that it’s a reasonable substitute for the overfished rockfish and snapper usually used in dishes like fish tacos, and other preparations where you want a mild, white fillet of fish. It has a moist texture that lends itself well to a variety of preparations. I always find myself wishing it were a little flakier and a little less gelatinous, but it works pretty well. You may also see it as Black Cod at the fish counter. This was a really easy dinner to make with little prep time and few ingredients. Its only down side is the number of pots and pans I used. One for the fish, one for the rice, one for the greens and yet another for the dal. If you cook the dal on a different day, that will make it a little less dish intensive. For the dal, I use red split lentils and just cook them in water with a little turmeric and salt until tender (takes about 20 minutes) Then I sauté chilies (either fresh green or dried red) with mustard seeds, cumin seeds, garlic, shallots, and whatever else I’m feeling like adding, over high heat in oil or ghee and then quickly add the sizzling hot mixture to the dal, stir in and cover to permeate the dal with flavor. Ratio of lentils to water is about 4 to 1. The rest you’ll have to eyeball. For the fish, I followed a recipe in Niloufer King’s fabulous James Beard Award winning My Bombay Kitchen for masala seafood. You don’t even need a recipe. 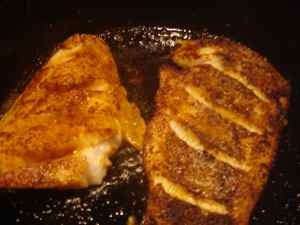 It’s basically cayenne, turmeric and salt rubbed into scored fish fillets that are then fried quickly in a very small amount of oil. It’s wonderful and wonderfully easy. 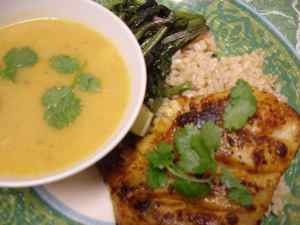 The rest of the meal is just sautéed mustard greens and Massa Brown Rice with some sprigs of fresh cilantro. And Hey! I’m going to Mexico for two weeks so you might not hear from me. I might try to blog from there, but not sure. At any rate, expect some good posts about Mexican food when I return. I’m staying with a family and I hear the Senora is a very good cook and I’ve been assured that I’ll be welcome in her kitchen. Qué Bueno! Feliz Navidad Y Año Nuevo! This entry was posted in Asian, Books, food sustainability, from the market, healthy, hearty, seafood. Bookmark the permalink. Post a comment or leave a trackback: Trackback URL. Its only down side is the number of pots and pans I used. One for the fish, one for the rice, one for the greens and yet another for the dal.